DO-37803-95 was succesfully added to your cart. To assure accuracy an individually serial-numbered Traceable® Certifi cate is provided from the manufacturer's ISO 17025 calibration laboratory accredited by A2LA. It indicates traceability to standards provided by NIST (National Institute of Standards and Technology). We do not provide a carrying case for this laser. 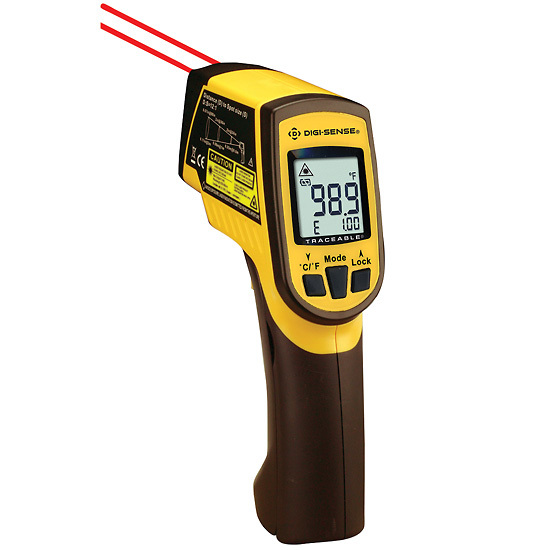 do you carry an infrared temp gun that will measure to 2345 fahrenheit without a k type probe? This would be used for measuring temps in a ceramic kiln. Thank you. Item 95001-18 has an IR range of -58 to 3992°F and also features a Type K range of -58 to 2498°F. Hi, I got your dual laser thermometer 37803-95. I don't understand why there are two laser beams? I need to measure the temp of a small electronic parts much smaller than the distance between two beams. Maybe I needed a different part with a single beam? The two laser beams indicate the outer diameter of the surface area being measured. Even the single laser beam option still measures a certain area. If your part is smaller than the area, then this instrument will work for you. can this instrument measure the ambient temp inside an auto by aiming thru the window? You would be measuring the surface temperature of the window. I was wondering if it was the IR thermometer being NIST certified or the K type probe or both? Also is the k type probe detachable, as in can different probes be exchanged and used? Also is this product still available? The calibration is performed and covers both temperature sensing capabilities of the gun; the thermocouple and IR. If a different type K probe is used, which you may, please note the calibration is no longer valid for the thermocouple portion. Yes, this product was just introduced in late 2012 - it's new and is still available. However, we do not have stock at this time.